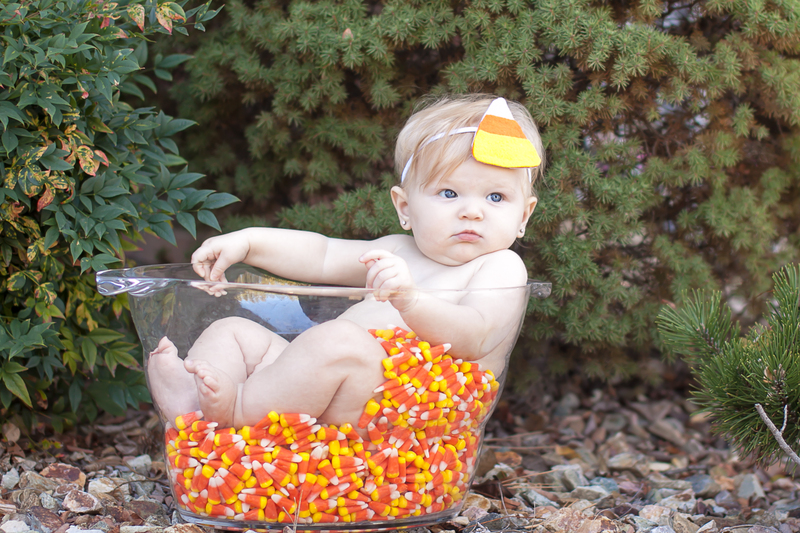 When my oldest daughter, Paisley, was 4 months old, I got this crazy idea to take photos of her in a tub of candy corn. Don’t ask, I have no idea!… But to this day, those photos definitely have a “sweet” spot in my heart. So of course, I had to reenact this photo-shoot with Payton, my 7 month old. One thing I learned this time around is that Payton (3 months older than Paisley was) already had a sweet tooth, and I had a hard time keeping the candy corn out of her mouth! 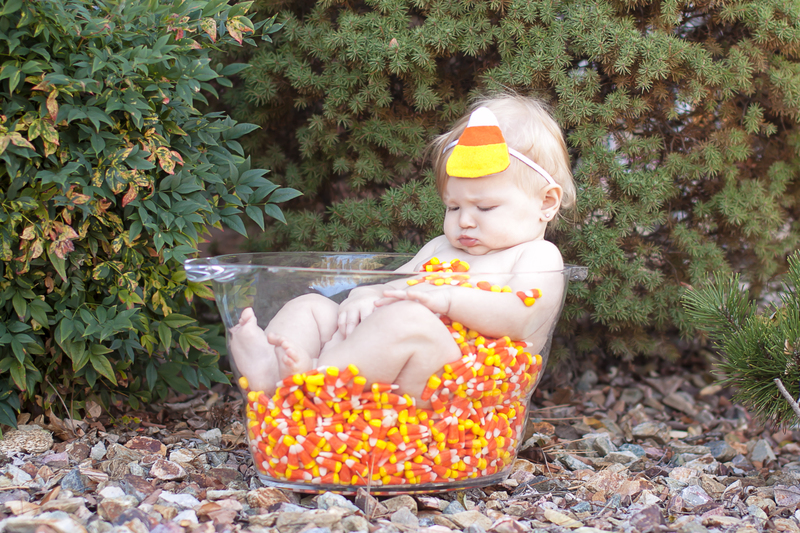 This candy corn photo-shoot is very easy to recreate. To make the candy corn headband, I bought three pieces of felt: white, orange and yellow. I cut the felt pieces into the triangle shape and hot-glued them onto a stretchy white headband. 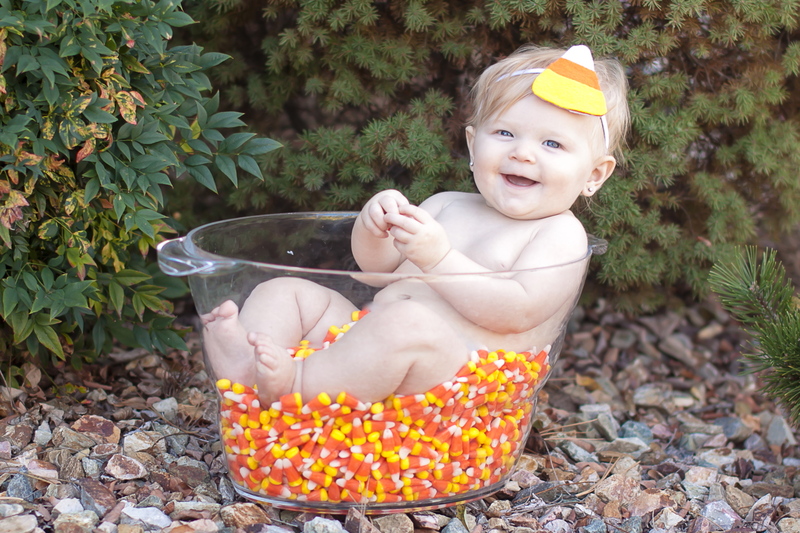 I bought 8 bags of candy corn and filled up a clear beverage tub for Payton to sit in. 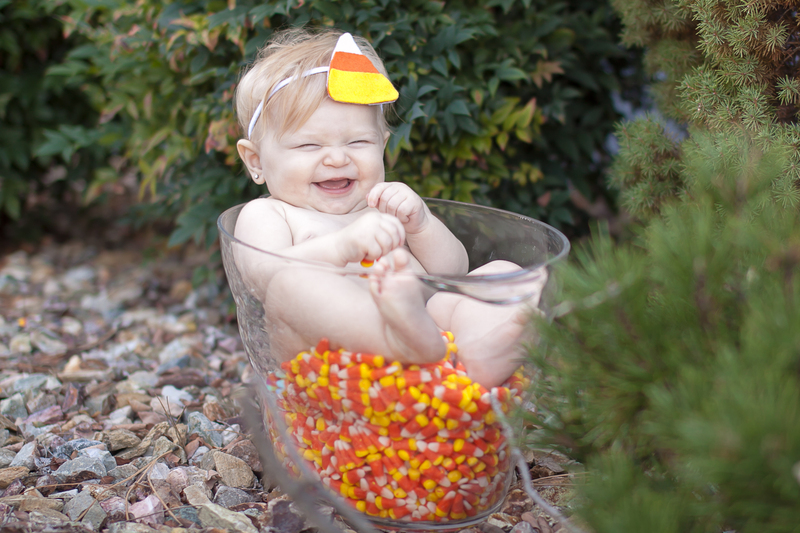 I left her diaper on and did my best to completely cover her with candy corn, so you can’t see it in the photos. Don’t forget to pick a fun fall backdrop – we took these photos in Prescott, Arizona. 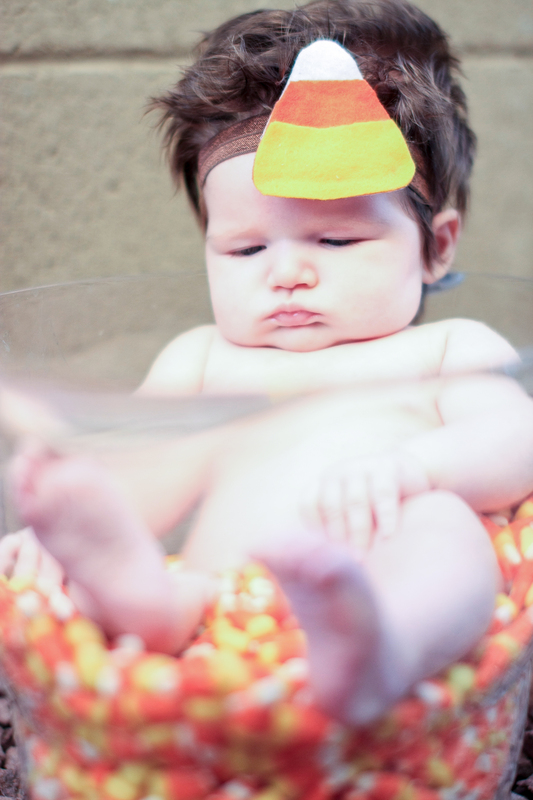 Here are a few of my favorite candy corn photos! There is nothing better than a good photo-op! Thankfully my hubby is very talented at taking photos and is extremely understanding and generous with his time; especially when it comes to me and my crazy ideas. Travis, I don’t tell you this enough … THANK YOU!!! 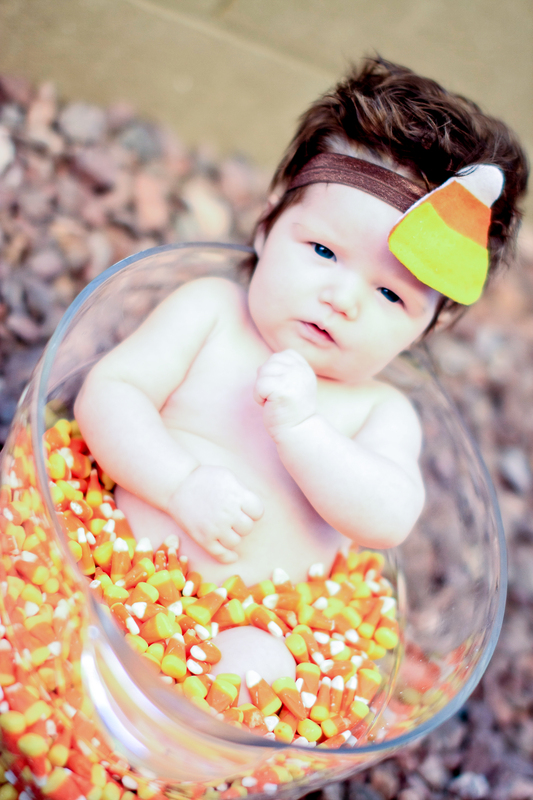 Here is a throwback to Paisley’s candy corn photo-shoot in October of 2012 at 4 months old. You can have so much fun taking photos with different holiday goodies. I encourage you to get creative, grab your camera and capture your kiddos doing something fun and memorable!!! OH MY! Cody and I are looking at these photos and can’t get over how cute they are! We just love that darling Payton of yours! Haha – Thank you Ashley. We had way too much fun taking these photos, she loved it!